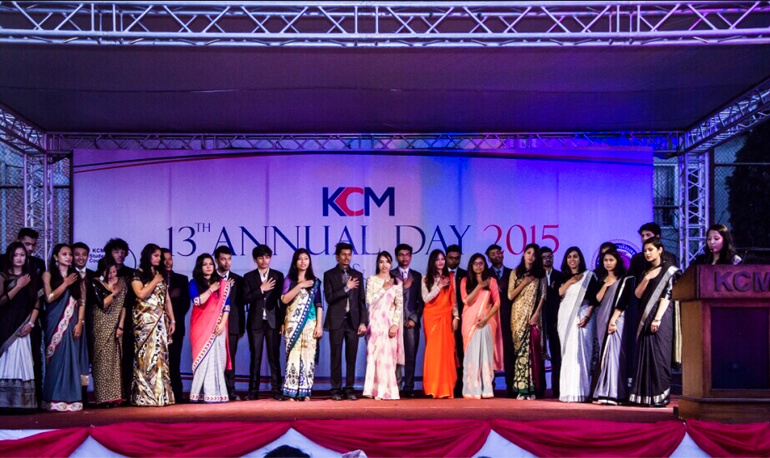 KCM celebrated its 19th anniversary and 13th annual day on 4th December 2015. The event was cherished by the presence of the guest of honor, the college’s chairman Mr. Nil Kantha Uprety, and the principal, Mr. Bishnu Raj Adhikari and our faculties and alumni. The event took place with a series. To start with the event, our guest of honor lit the lamp of knowledge and grace. The program then started by a beautiful Manjushree dance performance by 2nd year student Jenny Shrestha. It progressed with the award distribution. The award distribution included various categories, academic as well as extra curricular. Further, the chief guest and the former council president, Mr. Bijay Kumar Shrestha spoke inspirational words and motivated the students. The program then progressed with honoring the Student Council of last year followed by best council member award and handing over the emblem to the newly elected president of student council 2015-2016 by the outgoing president. Similarly, oath taking ceremony of student council 2015-16 and the club presidents of 2015-2016 took place. The program finally ended by a Tamang selo dance performance by 2nd year students and lastly by the best council member speech.